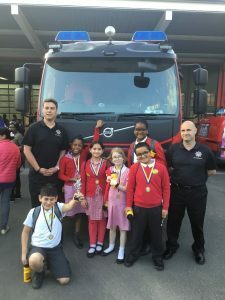 Congratulations to our Year 5 pupils for coming second in the West Midlands Fire Service Command Finals that took place at the Wolverhampton Fire Station. Pupils from all across the City took part initially and Year 5 earned a place in the final four. They answered questions on fire, sea, road and general safety. I am sure they will be advising us on how to stay safe at school!